One of the things that has been fun about teaching here in Uganda is the location of our schoolhouse. We are on campus at Good Shepherd's Fold children's home and school, so we have many interesting things right outside our door. Today I saw about a dozen very cute toddlers walking with a couple house moms all holding hands. It was so precious. Our classroom is located between the GSF school for nearly 400 children and the kitchen where they all are served posho and beans for lunch each day. Between the children's home and the school kids we get to see many children each day. Our school also backs up to part of the GSF farm. Yesterday I saw a farmer chasing a runaway calf. that calf often grazes right outside our door. There are also many banana trees there. And today the farm workers began planting orange trees and Jack-fruit trees there too. The oranges here are green though; they actually never turn orange. I have not yet tried the Jack-fruit, but have heard that it is an acquired taste. All of the fruit trees are probably the reason we have also seen so much wildlife. One day we saw 5 monkeys fairly close. They were looking around in the banana trees, I'm guessing for something to eat. We have also seen many birds: egrets, ibises, crows, eagles, herons, kites, hornbills, and wagtails. I'm not not making these names up; these are the real names of some of the birds here and good descriptions. One day we saw a heron eat a rat about 50 yards from our classroom door. I thought herons only ate fish, but apparently not. Recently there has been some landscape work around our classroom. Those of you who know David are probably not surprised. He has already begun his work to beautify the campus here. As the students finish their work they will sometimes go outside and help dig the drainage ditch/dry stream bed. 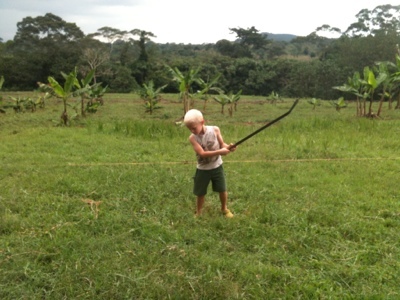 But today, since the grass was getting long, when they finished their work they went outside to do some slashing. Slashing is the most common way to cut grass around here. You swing this metal blade back and forth in order to cut the grass. So as I looked out the classroom door today, I saw my sons, Elijah and Ezra, slashing. The blades are not particularly sharp, but I still suggested that they only slash when no one else is standing around. 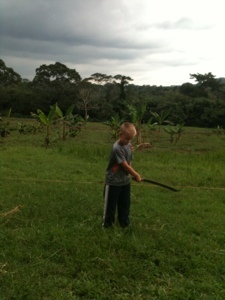 Our boys thoroughly enjoy this "chore," and it is a good way to get out some energy after sitting to do schoolwork.